Aboriginal groups from the Americas have begun talks in Argentina on ways of working together to step up pressure for the recognition of their rights. The two-day 2nd Indigenous Summit in Buenos Aires is sponsored by Canada. 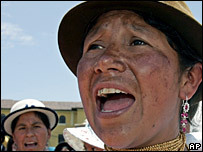 The head of the Organisation of Indigenous Peoples in Argentina, Victor Capitan, told the BBC that many communities share the same demands. "Their land has been taken away and they can't manage their resources," said Mr Capitan. "All this has driven indigenous people further into poverty." He added that the loss of land had forced many aborigines to migrate for jobs, mostly from rural areas to the margins of cities and shanty towns. Representatives at the summit, including the powerful National Indian Confederation of Ecuador, are discussing ways of opening spaces for their participation, fighting discrimination and tackling poverty. They are expected to prepare a final document on the situation of the indigenous peoples in the continent, which will be circulated during the Summit of the Americas. This forum of the Organisation of American States (OAS) starts on 4 November in the Argentine city of Mar del Plata. Indigenous groups also expect to send a delegation there to press for their demands. However, a number of aboriginal organisations announced they would not attend the meeting in Buenos Aires and would stage a parallel summit because they disagree with Canada's sponsorship. They said they did not want to get involved in a meeting backed by a developed country that had not done enough to improve the situation of aboriginal communities. The way in which provincial authorities in Canada share land and natural resources with indigenous groups is an ongoing issue. Canada - which also sponsored the first summit - says it has strongly advocated aboriginal rights in many international organisations. 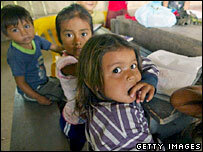 There are an estimated 250 million indigenous people in the world, according to the United Nations. In the Americas, they have a strong presence in Mexico, Central America, Brazil and the Andean countries.